The pressure on the gauge is not the pressure in the cell! It is the pressure on a hydraulic cylinder piston inside the press. The pressure inside the cell is proportional to the gauge pressure displayed and inversely proportional to the diameter of the piston in your cell. It also depends on whether you select medium or high pressure. 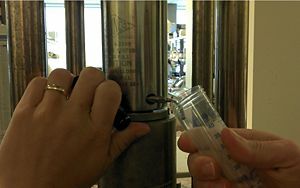 100 PSI applied to a french press cell on the medium mode does not cause the same pressure in the cell as using 100 PSI in the high mode. See the manual for more info. These are the pressures the cells were tested at before being sold. Safety reasoning suggests you should never ever come anywhere near that pressure. This precaution is made more complicated by the fact that the internal cell pressure does not match the pressure stated on the gauge. 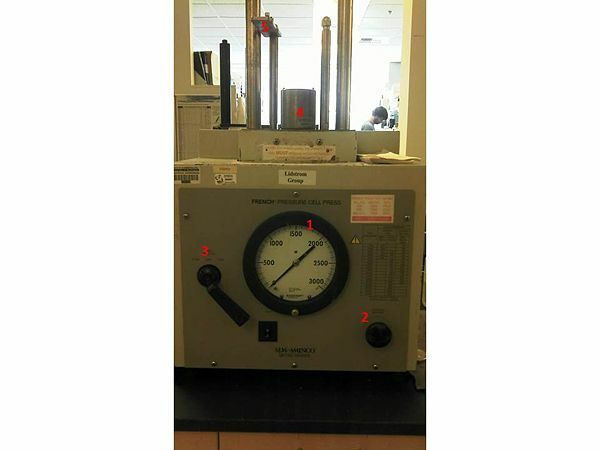 Do not exceed 9000-1000 PSI (displayed on gauge) for the smaller cells and only use the medium selector. This puts you in the ~20,000 PSI internal cell pressure range. 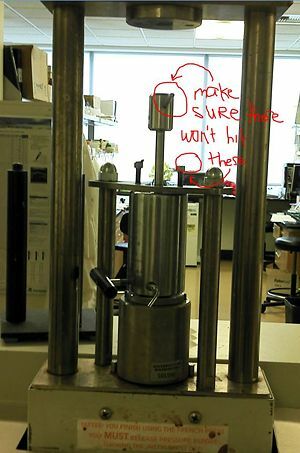 Large french press cell: do not exceed 500 PSI or use the high pressure position on the lever. Keep it clean. Salt corrodes metal, so wipe everything down after use. Don't chill the cell to -20oC or your sample will freeze when you put it in the block. If you need to chill a cell fast, put it in an ice bucket in the cold room. - Here is where you run the risk of losing sample, either out the spigot (if you force the cap on too hard and the valve isn't cracked), or out of the core (if you overfilled it); go slow! There is also no shame in pipetting up any accidentally ejected sample from the countertop and adding it to the next run! Tighten the screw valve, but only "finger tight"! - While the press is in operation, you are going to manually adjust the pressure inside the cylinder using this valve, and it's a very gentle adjustment...turns will only be a fraction of an inch to increase or decrease pressure! Be especially careful that the arms on the top of the piston will not be crushed by the screws protruding from the guide plate! - It's very important to maintain 1000 psi to evenly process your cells! When piston is almost fully depressed, and all your processed cells have been collected, turn the ratio selector back to "down"
- the manual says "There will be some sample loss due to material left in the valve ports and sample outlet tube. Do not try to squeeze out the last drop of sample. You will damage the piston, closure plug, and cell body." When you are completely finished with the machine, you MUST release the pressure before switching it off! Tidy up the shared work area! - Pack up your pipette tips/serilogical pipettes, ice buckets, tubes, etc., etc. - Campfire rules = leave the station in better shape than you found it! The large french press cell holds ~5-20mL of fluid. The maximum pressures should be assumed to be 500 PSI. Janet thinks it should be higher than the smaller cells, because the metal is thicker and the pressure rating on the large cell (30,000 PSI) is higher than the small cell (20,000 PSI). 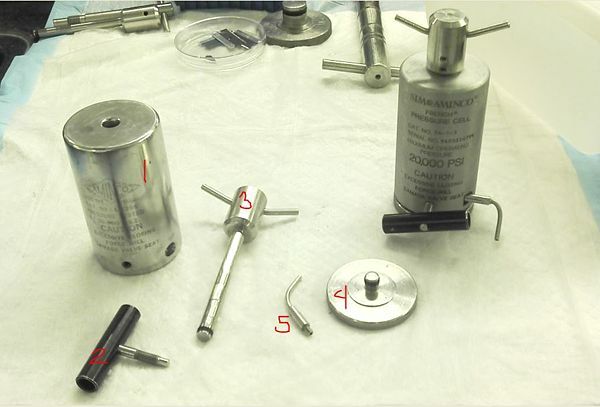 But the relationship between pressure inside the cell is some function of the piston diameter, gauge pressure displayed via the needle on the press base, and the pressure ratio selector. Stick with 500 PSI & the medium pressure lever position. If you are motivated for some reason to go higher, you should at a minimum: develop true understanding of the pressure inside the cell (use manuals, etc. ), contact a sales rep to make sure your understanding is right, figure out what the pressure ratio lever actually does, and consult the PI in the lab (Professor Lidstrom). 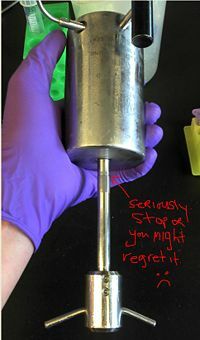 Failure to do these and more will lead to danger to yourself and others, and could ruin expensive lab equipment. This page was last edited on 5 June 2015, at 09:01.